Take a wee bit of Irish, mix with more than a bit of Scottish, and throw in a little Cherokee Indian and, well, you’ve created me. To honor my Irish ancestry, I’ve created an easy, casual little lunch menu. 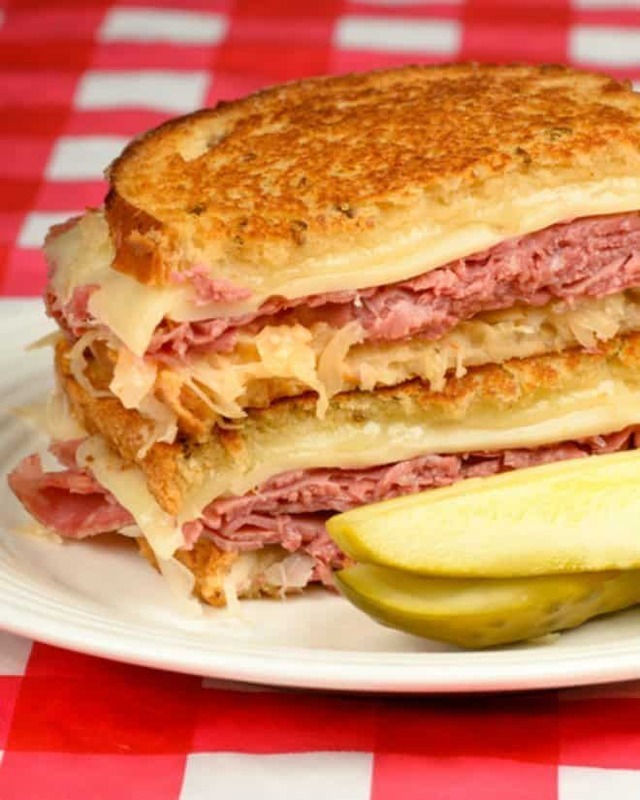 Technically, the Reuben sandwich is not an Irish thing, but corned beef is an American-Irish delight, so there! 🙂 Actually, some say that the Reuben is definitely Jewish, while others say that it’s most certainly German. Whatever the case, I say it’s scrumptious, so I’m featuring it for St. Patrick’s Day. This is what I found as I was researching: The origin of the Reuben is the source of much dispute. One story holds that Arthur Reuben invented the sandwich in 1914 at his New York City restaurant. Another account says that a grocer named Reuben Kulakofsky created the sandwich in Omaha, Nebraska in the 1920’s to feed a group of poker players at a late-night game. I don’t really care who invented the Reuben sandwich, the end result is a delicious and popular sandwich found at many delis nationwide and often in my kitchen. It’s one of my husband’s favorite sandwiches! Spread dressing on one side of six bread slices. Top with one cheese slice, sauerkraut, corned beef, and another cheese slice. Spread mayonnaise on one side of the remaining six slices of bread. Place bread slice, mayo side down, on top of cheese. You will have six sandwiches. Spread both sides of bread with softened butter. Heat a large nonstick skillet or griddle over medium heat. Cook sandwiches, in batches, 2 minutes per side until bread is golden and cheese is melted. Stir together first seven ingredients in a large bowl. Add cabbage and onions and toss well. Store in the fridge. Find the homemade potato chips here! They are scrumptious! But you can also buy some fancy, gourmet chips, already made! Find Shamrock Milkshake Cupcakes here! May the Good Lord take a liking to you… but not too soon! Yummy, yummy! I don’t need St Pat day to enjoy these great recipes! I know, right? That Reuben is my husband’s favorite sandwich. I have never had a Ruben. I love all the components but I have never had them all together. I need to try one soon. And the Home maid potato chips! Yum! You must try it and let me know what you think! I loved the recipe! I made my wife and she tasted and loved it! Thanks for the recipe!